One of the most successful and enduring musical partnerships in the North West is that between Westhoughton's two 'musical legends', the internationally-renowned Wingates Band, and the ever-popular folk trio, The Horton Weavers. The Weavers are celebrating their 40th anniversary, having begun life playing in Westhoughton pubs back in 1975, before progressing to a hugely successful career, involving extensive TV and radio broadcasts, and a prolific recording schedule. Wingates Band has just passed its 142nd birthday, having been founded in April 1873, but its special milestone in 2015 is that of a century of recording its magnificent music. Somewhat surprisingly, given the strictures of the dark days of World War I, the band's first recordings were made in the bandroom at Wingates Square, Westhoughton, in 1915. Four 10" shellac discs were recorded, on the most primitive of acoustic equipment, by a team from London-based Regal Records, who recorded for posterity the music of one of the most successful and best-known bands in the land at that time. Ever since, the renowned band has regularly recorded at venues throughout the country, embracing all successive technologies, including vinyl, cassette tape and compact discs. Only three brass bands in the world have a longer recording pedigree than Wingates, who now have over 200 exclusive recordings in their catalogue, as well as having featured on numerous other recordings, such as massed band concerts, together with choirs and diverse musical ensembles, and providing the backing music for solo performers. 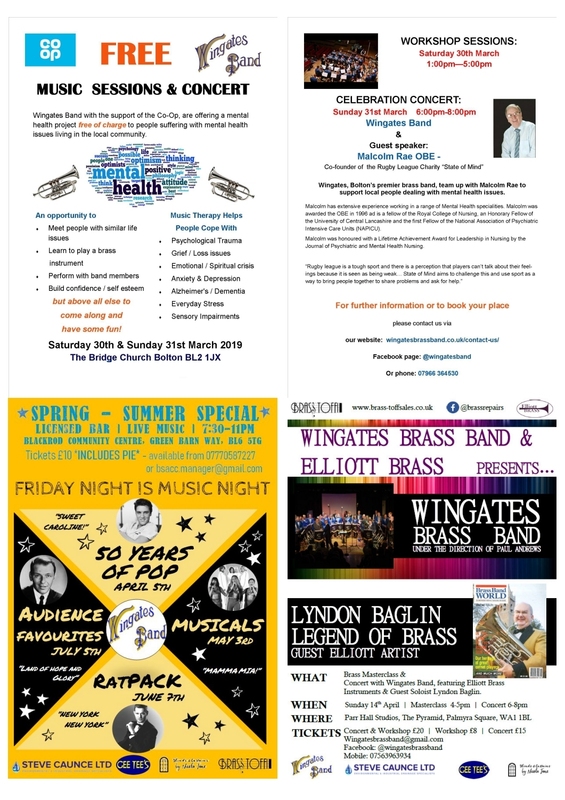 The Houghton Weavers have produced a commemorative brochure telling the story of their four decades, as well as a souvenir album, and later in 2015, Wingates Band will do likewise. Plans are now well in hand for a celebratory concert by the band in October, at St Bartholomew's Parish Church, Westhoughton, at which the band will launch an illustrated brochure telling the fascinating history of their recording story, complete with comprehensive discography. A souvenir album will be recorded in the town in June, which will feature a wide-ranging programme of music, with an item selected from each of the 10 decades of recordings, augmented by two brand-new pieces specially commissioned for the centenary. Whilst implementing their own plans for celebrating these special anniversaries, the two ensembles will also join together on several occasions throughout the year, as they have done for many years. The first such collaboration comes at the historic and atmospheric venue of Rivington Hall Barn, when, on Wednesday, 3rd June, the band and folk group combine to present 'Folk and Brass', which is the 27th concert in the hugely successful series which regularly attracts capacity audiences for wonderful evenings of music and mirth. The concert commences at 7:30pm, tickets are £9 (all classes) and can be purchased by callers at Rivington Hall Barn, or by calling 01204 696984. Press Release, 10th May 2015.